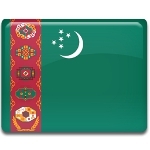 Transport and Telecommunication Workers Day is an official professional holiday in Turkmenistan. It is celebrated on March 7. The holiday was officially established by President Gurbanguly Berdimuhamedow in October 2017, and the first celebration took place in 2018. Transport and Telecommunication Workers Day was established to commemorate the opening of two new bridges across the Amu Darya, which connected Turkmenistan and Uzbekistan. It was an important event for the country’s transport, telecommunication and trade sphere, as well as for Turkmenistan’s relationship with Uzbekistan and other neighboring countries. Uzbek president Shavkat Mirziyoyev even was a guest of honor at the opening ceremony. The transport system of Turkmenistan includes airways, railways, roadways, seaways, riverways, and oil, gas and water pipelines. The country has three international airports (and one more is under construction), almost 5,000 km of railway line, an estimated 22,000 kilometers of roads, and a port on the Caspian Sea. Turkmenistan is part of the international transport corridor between Central Asia and the Persian Gulf, created under the Ashgabat agreement, signed in 2011.